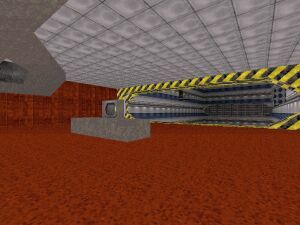 This level is based on some Unreal Tournament usermap called 'Sudden Drop'. I have never played the original piece so I can't compare it to this Duke3D version. It's said in the readme that this is not meant for dukematch and it's neither a single-player level. Instead we get this: "should work well for team deathmatch if there are any mods for it." Okay - no there are no team deathmatch modifications for Duke - nothing worth mentioning at least. So we can test this only in dukematch and I can say that it doesn't work at all. Player start points are badly placed - either you fall and die or just die. You can try to hit the pool but that won't help much because the bots will shoot you while you're falling. Weapons are very badly placed. They're on the both sides of the level and in one line - each of them. Design is empty and there are no shadows (except in one tunnel). There are some 'secret places' or 'alternative routes' but they won't do much. Elevators also move painfully slow.